I’ve got to tell you, it’s pretty hard for me to look at a photo of the long-toed salamander and resist breaking out in a “Crikey, would you look at that little fella” spiel… Which is why I’m so glad that Stewardship Pemberton’s Veronica Woodruff has agreed to take on a regular Species Watch column for us on the Wellness Almanac. But she’s away for a couple of weeks, and NOW is the time that the long toed salamander will commence breeding, so I’ll play down the accent to share a few cool facts gleaned from the interweb, until one of our region’s most passionate and knowledgeable experts on slimy, scaly and/or slippery critters (she’s a wetlands guru) gets back and can take the reins. The long toed salamander will start laying eggs in breeding ponds and ditches before the ice has completely disappeared. The larvae, like tadpoles, develop legs, and then, once they’re about 7cm long, they become land-lovers with lungs. Their fins and gills disappear. Long-toed Salamanders may live for six to ten years. They’re mostly nocturnal, and described as secretive or elusive, but they are found all over Pemberton. They actually do have a long toe – the fourth toe on their back feet. They eat insects, tadpoles, worms, beetles and small fish, and they get eaten by birds, fish, bullfrogs and garter snakes. When threatened, they secrete a poison from glands on their back and tail. 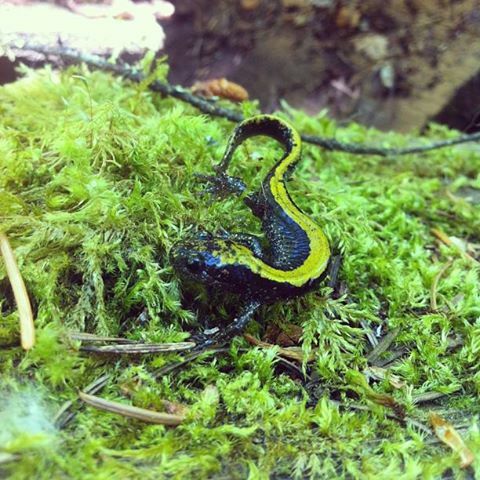 It’s super sticky and gluey – it acts as a kind of rubber cement that can stick predators to themselves or the ground for up to 40 minutes while the salamander makes a clean getaway. They can also lose their tails. Quite brilliantly, though, they can regenerate body parts – so they can grow that tail, or a leg that gets eaten, back. The smooth skin appears wet– most salamanders produce a mucous-like secretion that keeps them from drying out on land, and acts as a ‘wetsuit’ underwater to control the amount of water soaking through the skin. They can store fat in their tail to use as food during hard times. 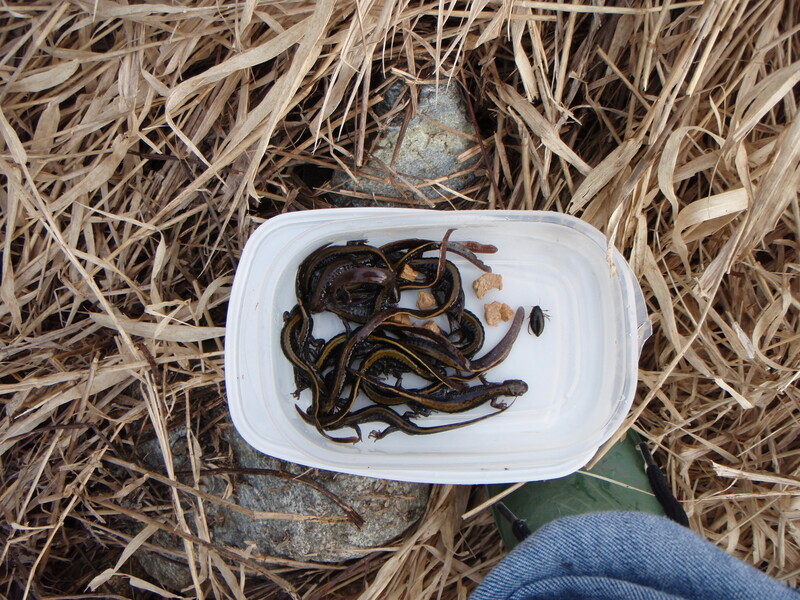 Long toed salamanders found in a ditch by Helmers Organic Farm. Photo by Veronica Woodruff.